Commercial smart wireless lighting is also growing rapidly due to plummeting LED and wireless component costs along with intensifying regulations. ON World’s 2015 smart lighting vendor survey found that there has been a rapid migration to wireless LED drivers and ballasts. Forty-four percent (44%) of respondents are developing or offering wireless LED drivers or ballasts up from 28% in our previous survey from Q4 2012. Network sizes are growing. Two in five indicate they have deployed 1,000 or more and 27% have deployed over 5,000 smart wireless lighting nodes at one location. 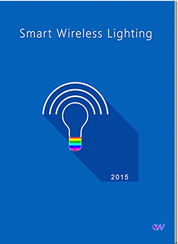 ZigBee has emerged as the leading smart wireless lighting technology. However, the number of smart LED bulbs using Bluetooth is rapidly growing and products based on Bluetooth Smart Mesh is an emerging trend. By the end of 2019, Bluetooth will become the second largest smart lighting technology up from 7% of residential unit sales in 2014. Based on vendor surveys and phone interviews with 1,200 individuals across the whole smart lighting value chain along with an evaluation of 250+ products and 20,000 consumer reviews, Smart Wireless Lighting analyzes the rapidly growing market for smart wireless lighting in the residential, commercial and outdoor markets. The report includes global five-year forecasts-- units and software/services-- by market, product segment, geography and technology; the results from surveys with consumers, vendors, retail outlets and other industry players; an in-depth technology evaluation and a competitive analysis with 70 companies across the whole smart lighting value chain. 1,200+ individuals including consumers, facility managers, home service providers, retail outlets, professional installers, lighting manufacturers, control system providers and component suppliers. In addition to surveying 1,000+ consumers, we interviewed/surveyed 90+ lighting manufacturers, control system vendors, facility/property managers, home service providers, retail outlets and professional installers. ON World provides global IoT business intelligence. Our market research is used by Fortune 1000 companies, startups and investors worldwide.